A creamy, herb-flecked mix of ricotta, parsley, garlic and lemon is just the thing for stuffing organic chicken thighs and drumsticks, which are roasted till crispy on the outside and succulent inside. Served with a roasted rabble of rosemary-scented potatoes and juicy tomato wedges. Preheat your oven to 200c/Fan 180c/Gas 6. Spoon the ricotta into a bowl. Grate in the zest from the lemon. Peel 1 garlic clove and crush or finely grate into the bowl. Finely chop the parsley and stir into the ricotta along with a little salt and pepper. Use the end of a teaspoon to make an opening underneath the skin of the chicken thighs and drumsticks. Stuff the ricotta mixture underneath the skin and flatten it out evenly. Pop the chicken onto a roasting tin and sprinkle over a pinch of salt and pepper. Rub the chicken with 1 tbsp oil and slide into the oven. Roast for 40 mins, till cooked through and crispy skinned. Scrub the potatoes and cut into bite-size chunks. Arrange in a second roasting tin. Toss with 1 tbsp oil and a good pinch of salt and pepper. Pick the rosemary leaves and sprinkle over the potatoes. Slide onto the oven shelf below the chicken and roast for 15 mins. While the potatoes are roasting, slice the tomatoes into thick wedges. Peel and thinly slice the remaining garlic clove. When the potatoes have roasted for 15 mins, remove the roasting tin from the oven and tuck in the tomato wedges. Scatter over the garlic slices. Return to the oven for a further 20 mins. Check that the chicken is cooked by piercing the largest piece – the juices should run clear and the meat should be white. If it still needs longer, return the chicken to the oven for a further 10 mins before testing again. 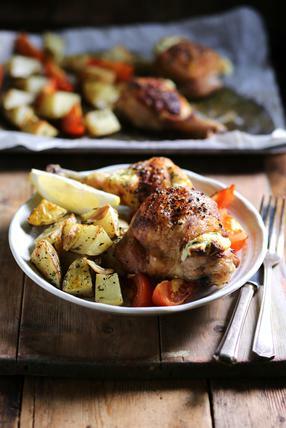 Serve the ricotta stuffed chicken with the rosemary roasted potatoes and tomatoes, with wedges of lemon on the side.